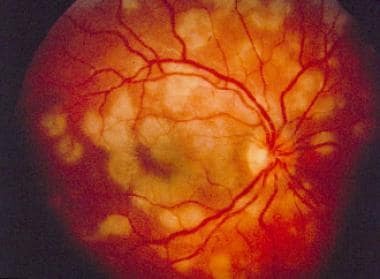 The diseases that constitute the white dot syndromes include acute posterior multifocal placoid pigment epitheliopathy (APMPPE), serpiginous choroiditis, multiple evanescent white dot syndrome (MEWDS), multifocal choroiditis and panuveitis (MCP), punctate inner choroidopathy (PIC), and diffuse subretinal fibrosis (DSF). Presumed ocular histoplasmosis syndrome (POHS) and birdshot retinochoroidopathy are additional white dot syndromes that are mentioned briefly in this article (see Presumed Ocular Histoplasmosis Syndrome; Retinopathy, Birdshot). Fundus examination reveals vitreous cells and flat yellow-white placoid lesions in the posterior pole, ranging in size from 0.5 to several disc diameters, as shown in the images below. Acute posterior multifocal placoid pigment epitheliopathy in right eye. Acute posterior multifocal placoid pigment epitheliopathy in left eye. Fluorescein angiography displays early hypofluorescence and late hyperfluorescence of the active lesions; examples are shown below. Fluorescein angiogram of acute posterior multifocal placoid pigment epitheliopathy in right eye. The lesions block fluorescence in this angiogram in the early venous phase. Fluorescein angiogram of acute posterior multifocal placoid pigment epitheliopathy in right eye. Late staining of lesions is noted in this late phase angiogram. Inactive lesions may show window defects as a result of depigmentation of retinal pigment epithelium. Indocyanine green angiography (ICG), with its ability to visualize the choroidal vascular structure, also has been used to diagnosis APMPPE. ICG angiography displays decreased visibility of the larger choroidal vessels in the early phase. The differential diagnosis includes sarcoidosis, MEWDS, and birdshot retinochoroidopathy. 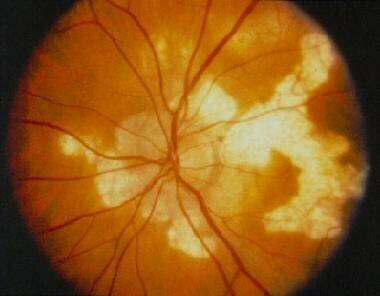 Sarcoidosis has small yellow-white retinal pigment epithelial lesions that are usually in the peripheral fundus. Ocular sarcoidosis may present together with systemic findings of the disease, which include bilateral pulmonary hilar adenopathy, articular changes, and erythema nodosum. Patients with MEWDS have unilateral visual loss and have small lesions that usually are located in the midperiphery. MEWDS displays early hyperfluorescence on fluorescein angiography and less depigmentation overall. Birdshot retinochoroidopathy, which often has an association with the presence of the human leukocyte antigen A29 (HLA-A29), also is usually bilateral but presents subacutely with smaller lesions and is associated with significant vitreous reaction and retinal vasculitis. 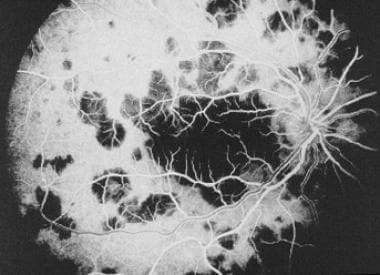 Fluorescein angiography may show retinal vascular leakage and macular edema. The pathogenesis of APMPPE is unknown. Occasionally, a viral prodrome occurs, and speculation exists that APMPPE may have an infectious etiology. In fact, adenovirus 5 has been isolated in one patient with a concurrent viral infection. APMPPE also has been associated with human leukocyte antigen DR2 (HLA-DR2) and human leukocyte antigen B7 (HLA-B7), suggesting a genetic predisposition to the disease. No treatment is required for most patients with APMPPE. The disease is self-limited with spontaneous recovery of vision in most cases. [15, 16] Of those eyes that are affected, 90% of them typically achieve a visual acuity of more than 20/25. In rare cases, recurrences may occur within 6 months of the initial episode, thereby giving a less favorable prognosis. In cases of foveal involvement, corticosteroids may be considered, although their efficacy has not been proven in a controlled study. Corticosteroids may be beneficial in cases of associated cerebral vasculitis. Choroidal neovascularization is a rare complication of APMPPE and treatment can be performed with intravitreal bevacizumab (Avastin). Gray-white lesions are noted at the level of the retinal pigment epithelium. Active lesions usually are found at the border of inactive lesions and appear in an interlocking polygonal pattern that spreads out toward the periphery from the optic nerve. An example is shown below. Serpiginous choroiditis. 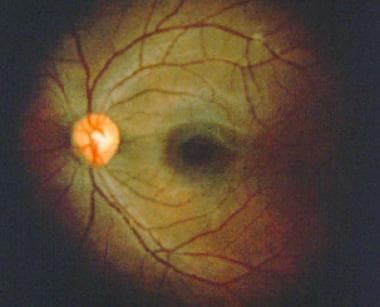 Pseudo–pod-like projections consisting of retinal pigment epithelium and choroidal atrophy that is surrounding the optic disc. Macular involvement is common. Mild vitreous and anterior chamber inflammation is observed in one third of cases. Branch vein occlusions, although not common, have been reported. On fluorescein angiography, hypofluorescence is present in the center of the lesions, and hyperfluorescence is present at the rim of the lesions in the early phase. Active lesions are hyperfluorescent in the late phase. Inactive lesions are hypofluorescent in the early phase and staining of the sclera is visible in the late phase. In addition, the choroidal vessels are easily seen on fluorescein angiography. ICG angiography does not contribute significantly toward the diagnosis. Serpiginous choroiditis often is confused with APMPPE. Younger patients with APMPPE who may have a viral prodrome typically present with an acute loss of vision. The lesions in APMPPE do not emanate from around the optic nerve, and active lesions do not border inactive lesions. APMPPE causes less scarring than serpiginous choroiditis. APMPPE has an acute onset and typically has a rapid recovery, whereas serpiginous choroiditis has a subacute presentation and ultimately results in significant visual loss, especially if the macula is involved. In addition, patients with serpiginous choroiditis are more likely to develop choroidal neovascularization than patients with APMPPE. Other diseases to consider in the differential diagnosis include MCP, age-related macular degeneration, and sarcoidosis. The etiology of serpiginous choroiditis is unknown. Speculation exists regarding an association with exposure to various toxic compounds. The pathology of serpiginous choroiditis reveals lymphocytic infiltration in the affected choroid and the presence of fibroglial tissue surrounding the Bruch membrane. Within a few weeks, the active lesions convert into inactive lesions with eventual retinal pigment epithelial atrophy. If foveal involvement is absent, the visual prognosis is good, and no treatment is necessary. However, if the fovea is involved, treatment with anti-inflammatory medication is recommended. A study involving long-term treatment with prednisone, cyclosporine, and azathioprine demonstrated a possible benefit. Additionally, the role of cyclosporine alone has been investigated. Recurrences are common in serpiginous choroiditis. A serious complication of serpiginous choroiditis is choroidal neovascularization. Laser photocoagulation has been used for extrafoveal choroidal neovascularization; however, it is of limited benefit, likely due to the abnormalities of the Bruch membrane and the presence of lymphocytic infiltration. There are limited reports on treatment of choroidal neovascularization with intravitreal bevacizumab (Avastin). The images below compare a normal fundus to MEWDS findings. Normal fundus of left eye. Multiple evanescent white dot syndrome in right eye. 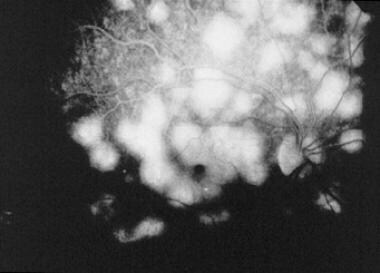 Fluorescein angiography demonstrates early punctate hyperfluorescence with late staining, in areas corresponding to the white dots, as shown in the image below. Fluorescein angiogram of multiple evanescent white dot syndrome in right eye. This angiogram demonstrates hyperfluorescence corresponding to white spots, mild macular edema, and disc leakage. On closer examination, the early fluorescence of the lesions appears in a wreathlike pattern. Patients with MEWDS may have optic nerve staining and retinal vascular sheathing. ICG angiography demonstrates multiple hypofluorescent spots in the posterior pole and hypofluorescence around the optic nerve head, particularly in patients with enlarged blind spots. The hypofluorescent spots persist until the patient recovers. Visual field testing usually shows considerable enlargement of the blind spot. The actual defect does not correlate with the distribution of white dots in the fundus, since the presence of white dots around the nerve are rare and the visual field defect persists even after the disappearance of the lesions. Electroretinographic studies demonstrate reduction of the a-wave amplitude and early receptor potential with prolonged early receptor potential regeneration times, indicating photoreceptor dysfunction. These abnormalities resolve with resolution of the disease. The differential diagnosis includes APMPPE, birdshot retinochoroidopathy, acute retinal pigment epitheliitis, and diffuse unilateral subacute neuroretinitis. APMPPE causes bilateral visual loss. The lesions in APMPPE are larger than MEWDS, and they block fluorescence early on fluorescein angiography, whereas there is early hyperfluorescence in MEWDS. Birdshot retinochoroidopathy differs from MEWDS because it presents as bilateral disease in older patients. Accompanied by a subacute presentation, it is associated with significantly greater vitreous inflammation when compared to MEWDS. 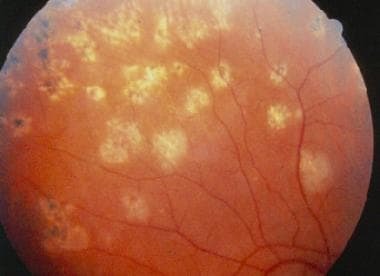 Acute retinal pigment epitheliitis, one of the very rare white dot syndromes, also presents with acute visual loss in young patients. However, it differs from MEWDS because the lesions are located in the macula and are dark in color with a halo of depigmentation. Electroretinogram findings are normal in these patients. Diffuse unilateral subacute neuroretinitis has been attributed to an intraocular nematode. Patients present with unilateral loss of vision and widespread retinal pigment epithelial atrophy and optic atrophy. It differs from MEWDS in that there is a prolonged clinical course and associated progressive loss of vision. The pathogenesis of MEWDS is unknown. The frequent viral prodrome may indicate an infectious etiology. Since the disease has a strong female predominance, hormonal status as a possible contributing factor is being investigated. MEWDS is a self-limited disease with almost all patients regaining good visual acuity within 3-9 weeks. Consequently, no treatment is recommended for patients with MEWDS. The lesions disappear without scarring, and photopsias and scotomata gradually resolve. Occasionally, patients with MEWDS may have persistent blind spot enlargement. Although uncommon, recurrences can occur. However, the prognosis is fairly good for these patients. 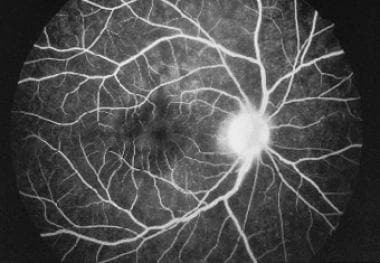 A rare complication of MEWDS is choroidal neovascularization that may require treatment with laser photocoagulation or intravitreal bevacizumab. MCP is a relatively common disease that is characterized by multifocal chorioretinal lesions with significant anterior chamber and vitreous inflammation. It occurs predominantly in myopic females between the second and sixth decades of life, with a mean age of onset of 33 years. Patients usually present with an acute onset of blurred vision, photopsias, and scotomata. Bilateral involvement is present in approximately 75% of patients. Examination of the fundus reveals multiple yellow or gray lesions at the level of the choroid and retinal pigment epithelium. MCP is shown in the image below. Multifocal choroiditis and panuveitis. Multiple midperipheral atrophic yellowish scars with dark centers are seen. These active lesions can range in size from 50-1000 µm and can be numerous (as many as several hundred at a time). The lesions usually are concentrated in the midperiphery. The active lesions can progress into chronic lesions, which are punched-out atrophic scars that develop pigmentation over time. The optic disc is usually normal, although, in some cases, it may be edematous. Peripapillary scarring and prominent linear chorioretinal streaks also may be present. 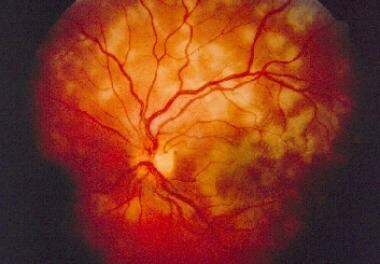 [33, 34] Choroidal neovascularization can be present, in addition to peripapillary fibrosis. Almost all patients have vitreous inflammation, and many have anterior chamber inflammation. The patient also may present with cystoid macular edema. The diagnosis is based on clinical examination and can be confirmed by angiographic studies. Fluorescein angiography demonstrates that active lesions show early hypofluorescence and late hyperfluorescence. However, if patients present at a later stage, the active lesions usually have scarred or are in the process of scarring, thereby giving early hyperfluorescence and late staining. 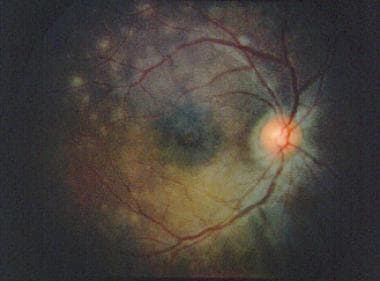 If choroidal neovascularization is present, it usually is observed as early hyperfluorescence with a lacy appearance and a late leakage of dye. ICG angiography shows both active and chronic lesions as hypofluorescent. ICG angiography of choroidal neovascularization reveals hyperfluorescence. Patients with MCP have a chronic condition with recurrent bouts of active lesions and vitreous inflammation. These patients require long-term follow-up care. Overall, visual prognosis is variable, with final visual acuity of 20/40 or better in 66% of eyes. With each bout of inflammation, patients with MCP develop more active lesions, which later become atrophic with significant scarring. Visual loss usually results from inflammatory scars in the fovea, cystoid macular edema, choroidal neovascularization, and iatrogenic induced by long-term corticosteroid use. The treatment of patients with MCP consists of corticosteroids. Oral steroids are helpful in patients with active posterior segment inflammation or with cystoid macular edema. Topical corticosteroids are helpful if there is severe anterior segment inflammation. However, cases in which corticosteroids have not improved the inflammation have been described. The most common complication of MCP is choroidal neovascularization, which develops in 30% of patients. Laser photocoagulation or intravitreal bevacizumab may be indicated in these patients. Oral steroids also may be used for choroidal neovascularization since they have been shown to decrease the neurosensory detachments associated with choroidal neovascular membranes. Both PIC and DSF represent a spectrum of disease as it relates to MCP. PIC represents a milder form of disease, while DSF is a more severe form. Diagnosis is by clinical examination, fluorescein angiography, and HLA-A29 status. Fluorescein angiography demonstrates mild hyperfluorescence and staining in the late phase. The pathogenesis is unknown at this time; however, speculation exists regarding an autoimmune etiology. Ocular and systemic corticosteroids are generally the treatment of choice. Birdshot retinochoroidopathy is a chronic disease with multiple recurrences, and, consequently, the long-term visual prognosis generally is guarded. POHS usually occurs in endemic areas of Histoplasma capsulatum, which includes the Ohio and Mississippi River Valley. Typically, adults in the fourth decade of life are affected. No sexual predilection exists. Patients may be asymptomatic or may present with visual decline and a central scotoma. On ocular examination, the vitreous is clear with no evidence of inflammation. Typically, peripapillary atrophy, atrophic chorioretinal lesions, and choroidal neovascularization are present. The lesions, which are yellow in color and resemble punched-out lesions, also may be present in the macula. Linear streaks in the midperiphery are found in a minority of the patients. The pathogenesis is presumed to be due to H capsulatum; however, the organism has never been isolated from the choroid. Fluorescein angiography shows the typical features of choroidal neovascularization, ie, early lacy hyperfluorescence with late leakage. Management of this condition can include intravitreal bevacizumab. Controversy exists involving the white dot syndromes; some have stated that because of the significant overlap among them, the various white dot syndromes may just represent a spectrum of the same disease. For example, women have a predilection for multifocal choroiditis, PIC, and MEWDS. Occasionally, patients have presented with findings consistent with a specific syndrome; then, they later developed findings that led to the diagnosis of a different white dot syndrome. Although controversy may exist in the artificial classification of these syndromes, it is clear that an accurate diagnosis needs to be attained in all cases to ensure appropriate management may be undertaken. Folk JC, Reddy CV. White dot chorioretinal inflammatory syndromes. Lewis H, Ryan SJ, eds. Medical and Surgical Retina: Advances, Controversies, and Management. St Louis: Mosby-Year Book; 1994. 385-400. Gass JD. Stereoscopic Atlas of Macular Diseases: Diagnosis and Treatment. 4th ed. Philadelphia: WB Saunders Co; 1997. 158-165. Spaide RF. White dot syndromes. Spaide RF, ed. Diseases of the Retina and Vitreous. Philadelphia: WB Saunders Co; 1999. 195-213. Moorthy RS, Rao N. Noninfectious chorioretinal inflammatory conditions. Regillo CD, Brown GC, Flynn HW Jr, eds. Vitreoretinal Disease: The Essentials. New York: Thieme; 1999. 417-438. Polk TD, Goldman EJ. White-dot chorioretinal inflammatory syndromes. Int Ophthalmol Clin. 1999. 39(4):33-53. [Medline]. Gass JD. Acute posterior multifocal placoid pigment epitheliopathy. Arch Ophthalmol. 1968 Aug. 80(2):177-85. [Medline]. Jones NP. Acute posterior multifocal placoid pigment epitheliopathy. Br J Ophthalmol. 1995 Apr. 79(4):384-9. [Medline]. Ryan SJ, Maumenee AE. Acute posterior multifocal placoid pigment epitheliopathy. Am J Ophthalmol. 1972 Dec. 74(6):1066-74. [Medline]. Savino PJ, Weinberg RJ, Yassin JG, Pilkerton AR. Diverse manifestations of acute posterior multifocal placoid pigment epitheliopathy. Am J Ophthalmol. 1974 May. 77(5):659-62. [Medline]. Vedantham V, Ramasamy K. Atypical manifestations of acute posterior multifocal placoid pigment epitheliopathy. Indian J Ophthalmol. 2006 Mar. 54(1):49-52. [Medline]. Van Buskirk EM, Lessell S, Friedman E. Pigmentary epitheliopathy and erythema nodosum. Arch Ophthalmol. 1971 Mar. 85(3):369-72. [Medline]. Wilson CA, Choromokos EA, Sheppard R. Acute posterior multifocal placoid pigment epitheliopathy and cerebral vasculitis. Arch Ophthalmol. 1988 Jun. 106(6):796-800. [Medline]. Parmeggiani F, Costagliola C, D'Angelo S, Incorvaia C, Perri P, Sebastiani A. Clear cell renal cell carcinoma associated with bilateral atypical acute posterior multifocal placoid pigment epitheliopathy. Oncology. 2004. 66(6):502-9. [Medline]. Azar P Jr, Gohd RS, Waltman D, Gitter KA. Acute posterior multifocal placoid pigment epitheliopathy associated with an adenovirus type 5 infection. Am J Ophthalmol. 1975 Dec. 80(6):1003-5. [Medline]. Williams DF, Mieler WF. Long-term follow-up of acute multifocal posterior placoid pigment epitheliopathy. Br J Ophthalmol. 1989 Dec. 73(12):985-90. [Medline]. Fiore T, Iaccheri B, Androudi S, Papadaki TG, Anzaar F, Brazitikos P, et al. Acute posterior multifocal placoid pigment epitheliopathy: outcome and visual prognosis. Retina. Jul-Aug 2009. 29:994-1001. [Medline]. Lyness AL, Bird AC. Recurrences of acute posterior multifocal placoid pigment epitheliopathy. Am J Ophthalmol. 1984 Aug 15. 98(2):203-7. [Medline]. Mansour AM, Jampol LM, Packo KH, Hrisomalos NF. Macular serpiginous choroiditis. Retina. 1988. 8(2):125-31. [Medline]. Bock CJ, Jampol LM. Serpiginous choroiditis. Albert DM, Jakobiec FA, eds. Principles and Practice of Ophthalmology. Philadelphia: WB Saunders Co; 1994. Vol. 1: 517-23. Hooper PL, Kaplan HJ. Triple agent immunosuppression in serpiginous choroiditis. Ophthalmology. 1991 Jun. 98(6):944-51; discussion 951-2. [Medline]. Wu JS, Lewis H, Fine SL, Grover DA, Green WR. Clinicopathologic findings in a patient with serpiginous choroiditis and treated choroidal neovascularization. Retina. 1989. 9(4):292-301. [Medline]. Jampol LM, Sieving PA, Pugh D, Fishman GA, Gilbert H. Multiple evanescent white dot syndrome. I. Clinical findings. Arch Ophthalmol. 1984 May. 102(5):671-4. [Medline]. Jampol LM, Tsai L. Multiple evanescent white dot syndrome. Ryan SJ, ed. Retina. St Louis: Mosby-Year Book; 1994. 1699-1703. Gross NE, Yannuzzi LA, Freund KB, Spaide RF, Amato GP, Sigal R. Multiple evanescent white dot syndrome. Arch Ophthalmol. 2006 Apr. 124(4):493-500. [Medline]. Slusher MM, Weaver RG. Multiple evanescent white dot syndrome. Retina. 1988. 8(2):132-5. [Medline]. Mamalis N, Daily MJ. Multiple evanescent white-dot syndrome. A report of eight cases. Ophthalmology. 1987 Oct. 94(10):1209-12. [Medline]. Stangos A, Zaninetti M, Petropoulos I, Baglivo E, Pournaras C. Multiple evanescent white dot syndrome following simultaneous hepatitis-A and yellow fever vaccination. Ocul Immunol Inflamm. 2006 Oct. 14(5):301-4. [Medline]. Huang J, Spaide R. Appearance of brown areas after resolution of the acute phase of multiple evanescent white dot syndrome. Retina. 2004 Oct. 24(5):814-6. [Medline]. Dodwell DG, Jampol LM, Rosenberg M, Berman A, Zaret CR. Optic nerve involvement associated with the multiple evanescent white-dot syndrome. Ophthalmology. 1990 Jul. 97(7):862-8. [Medline]. Singh K, de Frank MP, Shults WT, Watzke RC. Acute idiopathic blind spot enlargement. A spectrum of disease. Ophthalmology. 1991 Apr. 98(4):497-502. [Medline]. Sieving PA, Fishman GA, Jampol LM, Pugh D. Multiple evanescent white dot syndrome. II. Electrophysiology of the photoreceptors during retinal pigment epithelial disease. Arch Ophthalmol. 1984 May. 102(5):675-9. [Medline]. Aaberg TM, Campo RV, Joffe L. Recurrences and bilaterality in the multiple evanescent white-dot syndrome. Am J Ophthalmol. 1985 Jul 15. 100(1):29-37. [Medline]. Matsumoto Y, Francis JH, Yannuzzi LA. Curvilinear streaks in multifocal choroiditis. Eur J Ophthalmol. 2007 May-Jun. 17(3):448-50. [Medline]. Spaide RF, Yannuzzi LA, Freund KB. Linear streaks in multifocal choroiditis and panuveitis. Retina. 1991. 11(2):229-31. [Medline]. Dreyer RF, Gass DJ. Multifocal choroiditis and panuveitis. A syndrome that mimics ocular histoplasmosis. Arch Ophthalmol. 1984 Dec. 102(12):1776-84. [Medline]. Browning DJ, Fraser CM. Primary intraocular lymphoma mimicking multifocal choroiditis and panuveitis. Eye. 2007 Jun. 21(6):880-1. [Medline]. Spaide RF, Sugin S, Yannuzzi LA, DeRosa JT. Epstein-Barr virus antibodies in multifocal choroiditis and panuveitis. Am J Ophthalmol. 1991 Oct 15. 112(4):410-3. [Medline]. Morgan CM, Schatz H. Recurrent multifocal choroiditis. Ophthalmology. 1986 Sep. 93(9):1138-47. [Medline]. Vianna RN, Ozdal PC, Filho JP, Ventura MP, Saraiva VS, Deschênes J. Longterm follow-up of patients with multifocal choroiditis and panuveitis. Acta Ophthalmol Scand. 2004 Dec. 82(6):748-53. [Medline]. Dunlop AA, Cree IA, Hague S, Luthert PJ, Lightman S. Multifocal choroiditis: clinicopathologic correlation. Arch Ophthalmol. 1998 Jun. 116(6):801-3. [Medline]. Watzke RC, Packer AJ, Folk JC, Benson WE, Burgess D, Ober RR. Punctate inner choroidopathy. Am J Ophthalmol. 1984 Nov. 98(5):572-84. [Medline]. Brown J Jr, Folk JC, Reddy CV, Kimura AE. Visual prognosis of multifocal choroiditis, punctate inner choroidopathy, and the diffuse subretinal fibrosis syndrome. Ophthalmology. 1996 Jul. 103(7):1100-5. [Medline]. Cantrill HL, Folk JC. Multifocal choroiditis associated with progressive subretinal fibrosis. Am J Ophthalmol. 1986 Feb 15. 101(2):170-80. [Medline]. Gasch AT, Smith JA, Whitcup SM. Birdshot retinochoroidopathy. Br J Ophthalmol. 1999 Feb. 83(2):241-9. [Medline]. Monnet D, Brézin AP. Birdshot chorioretinopathy. Curr Opin Ophthalmol. 2006 Dec. 17(6):545-50. [Medline]. Priem HA, Kijlstra A, Noens L, Baarsma GS, De Laey JJ, Oosterhuis JA. HLA typing in birdshot chorioretinopathy. Am J Ophthalmol. 1988 Feb 15. 105(2):182-5. [Medline]. LeHoang P, Ozdemir N, Benhamou A, Tabary T, Edelson C, Betuel H, et al. HLA-A29.2 subtype associated with birdshot retinochoroidopathy. Am J Ophthalmol. 1992 Jan 15. 113(1):33-5. [Medline]. Priem HA, Oosterhuis JA. Birdshot chorioretinopathy: clinical characteristics and evolution. Br J Ophthalmol. 1988 Sep. 72(9):646-59. [Medline]. Wong E, Nivison-Smith L, Assaad NN, Kalloniatis M. OCT and Fundus Autofluorescence Enhances Visualization of White Dot Syndromes. Optom Vis Sci. 2015 May. 92 (5):642-53. [Medline]. Faia LJ. Gender differences in birdshot chorioretinopathy and the white dot syndromes: do they exist?. J Ophthalmol. 2014. 2014:146768. [Medline]. Crawford CM, Igboeli O. A review of the inflammatory chorioretinopathies: the white dot syndromes. ISRN Inflamm. 2013. 2013:783190. [Medline]. Disclosure: Serve(d) as a director, officer, partner, employee, advisor, consultant or trustee for: Bausch and Lomb; Dutch Ophthalmic<br/>Serve(d) as a speaker or a member of a speakers bureau for: Allergan.